OK, At no point did I see myself writing this……. Regatta have only gone & done it again. I’ve had a total change of view having spent the weekend wearing the Regatta Acadia Down-Touch padded jacket. Unthinkable less than a week ago I’d never consider a Padded Jacket, Now I’m a convert! So, what didn’t I like about the idea? Basically the whole padded jacket look, the concept that something so think was an outdoor jacket, That technology might be a good thing, I enjoyed being a luddite! “Get yourself a proper outdoor coat” was the mantra….. But here we are! Stretch binding on hood, cuffs and hem. 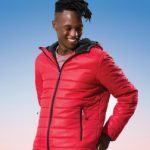 Warmth: The Acadia Down-Touch jacket took me by surprise. It was freezing out there, the wind was howling & the wind chill was biting and guess what? I was warm! This wasn’t meant to happen, A warm outdoor jacket that doesn’t involve a full fleece lining? That can’t be right! What witchcraft is this that’s making it all work? Size Range: Available in both unisex & ladies specific fits. The unisex goes from size small up to a 3xl. The ladies fits are from size 10 up to a size 20. Colours: Currently available in 9 different colourways in the unisex & 8 in the ladies specific fit. So there it is! How you surprise & reform a man with a jacket! This entry was posted in Jackets on 1st February 2018 by admin.